Brilliant amber color. Funky aromas of caramel and fruity pebbles, parmesan rind, cedar chips and mint, and sweet yogurt with a satiny, vibrant, dry-yet-fruity medium body and a peppery, medium-length eucalyptus and cigar wrapper, Newport cigarettes and sanded wood, anise and nutmeg, and caramelized banana and prunes finish. A lightly smoky American whiskey with a big herbal kick. Bottom Line: A lightly smoky American whiskey with a big herbal kick. 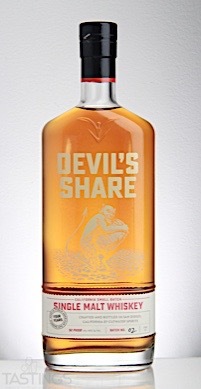 Devil’s Share Single Malt Whiskey rating was calculated by tastings.com to be 86 points out of 100 on 8/24/2017. Please note that MSRP may have changed since the date of our review.